I received an unsolicited fruitcake this week. A friend had read the article about my blog and sent along a loaf of her mother's home-made family recipe. A good commercially made (or perhaps non-profit made) fruitcake is what I have grown up with and it's what I like. But people, if the fruitcake I tried this week, as well as my boss' Christmas cake is any indication, NO commercially-made fruitcake is as good as homemade fruitcake. This is the first fruitcake (blurry photo above) where I don't know all the ingredients off the bat, but I know that it doesn't contain booze, does have butter, and only contains a small amount of flour. You can absolutely taste the butter, it adds a great richness, and the outside is almost caramelized, giving it a lovely flavor. A secret ingredient (at least one that I can figure out from its obviousness): dates. What an excellent addition! It's different, but doesn't overpower the other fruit, just adds some distinct flavor. 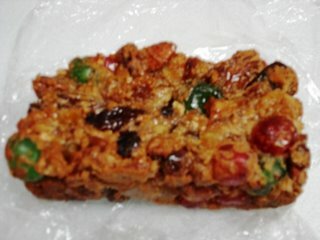 Now, my main reason for creating this blog was to review the commercial fruitcakes out there, in order to give a semi-objective description of what they taste like. And that's what I'll continue to do, because man, do I have a list to get through. Who knew there were so many commercial fruitcakes out there for sale? Somebody out there must like them!! So please, although I have thoroughly enjoyed the home-made fruitcakes I've received, please don't hunt me down and hand me fruitcake. After all, it's January, and I need a hiatus! Gosh, I love this self-assigned job--eating fruitcake. I am truly the luckiest girl ever. Here I am, very late, to say "Thank You! ", if I haven't done so already. I honestly can't recall if I ever thanked you for your magnificent gift of fruitcake remnants sent winging my way. If I forgot, it is inexcusable. Anyway, I enjoyed them very much and almost sated my desire for fruitcake. You are a princess and an angel! Hey Suldog, you're most welcome!! Take notes on the fruitcakes I'll be reviewing this year: you're destined to get the remnants of those, as well!! My sister has for some time now received a Trinidad Black Cake every holiday season. This past year her friend who normally makes was unable (for the first time in many years). Being a baker, the duty passed to me, by my sister's request. She says my version was very good. Look it up, if you'd like I will send you one this year. I start the process in October. It is truly a hilarious cake. It is almost black, sticky, rich, and incredibly addictive. Love your blog.